The day before the trip, heaven broke loose and poured heavy rain over Bangalore. We drove through a sea of water on the roads on the way back home from office. Anxiety streaked my mind as I carried on my pre-trip preparations (something I had written earlier). I strained my ears all night to hear if the rain had stopped. This was not how I had expected to welcome the monsoons. Not on the day we were supposed to go out looking for birds and wildlife. The sky was still gloomy and overcast with dark clouds when we left our home at 5.45 am on June 1. I tried to keep a cheerful face and told the husband that we should enjoy the journey and not think about our aspirations. The journey was indeed a beautiful one. 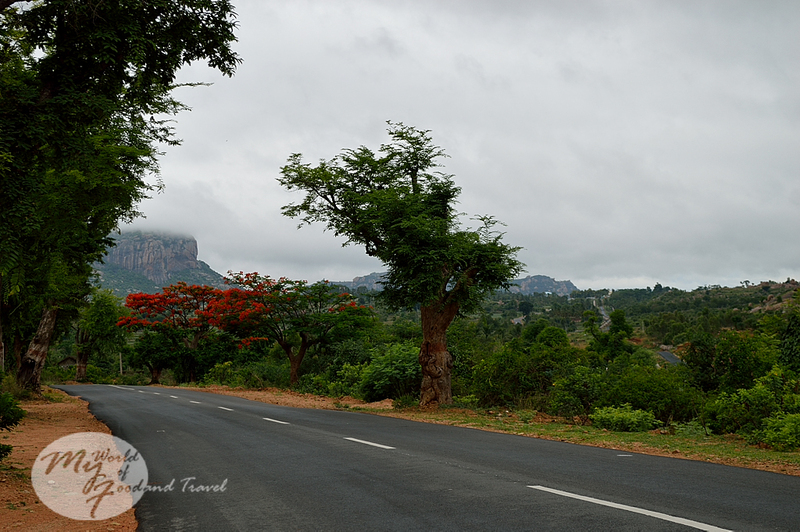 The rains had brought down the mercury levels drastically and fresh, cool winds uplifted our spirits. 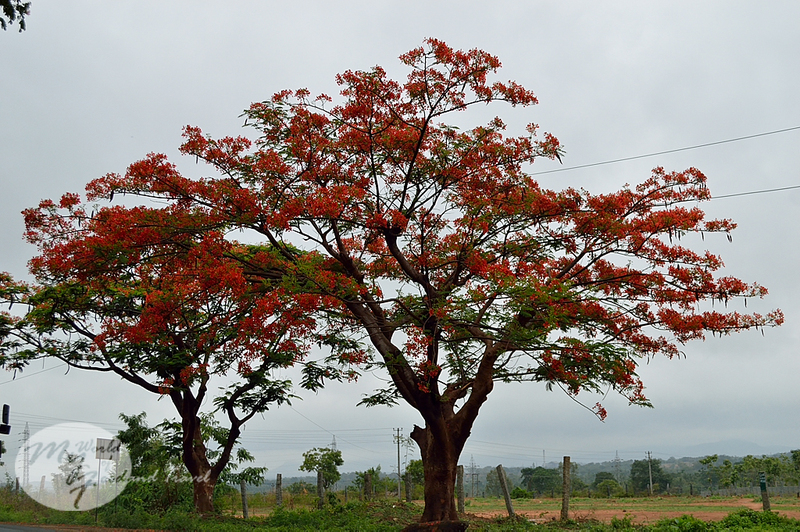 The Gulmohur and Tabebuia trees were in their glorious best and the roads were lined in alternate colours of blazing red, orange, yellow and purple. They took my breath away. We frequently stopped along the way to try and capture the frames. “At least we will have pictures of the journey, if not birds and animals,” said the husband, who normally prefers to reach the destination first before unpacking his camera bag. 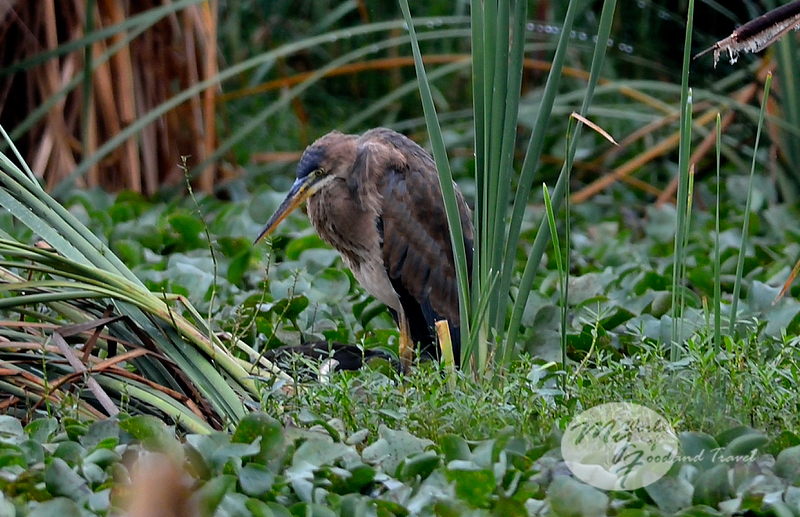 The heavy rains on the previous day had resulted in filling up the fields on both sides of the road and we could see egrets and grey herons searching for an early morning breakfast. We halted at every water body to try and catch some water birds but it was not till we had nearly reached Kanakapura that we got our big break. 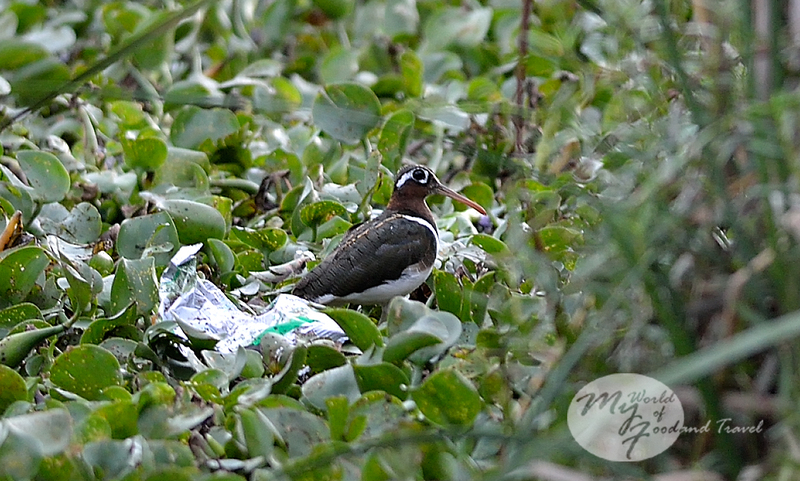 There lay by the side of the road a considerably large lake/marshy area, thriving with bird life, but fast turning into a dump yard (why am I not surprised?). 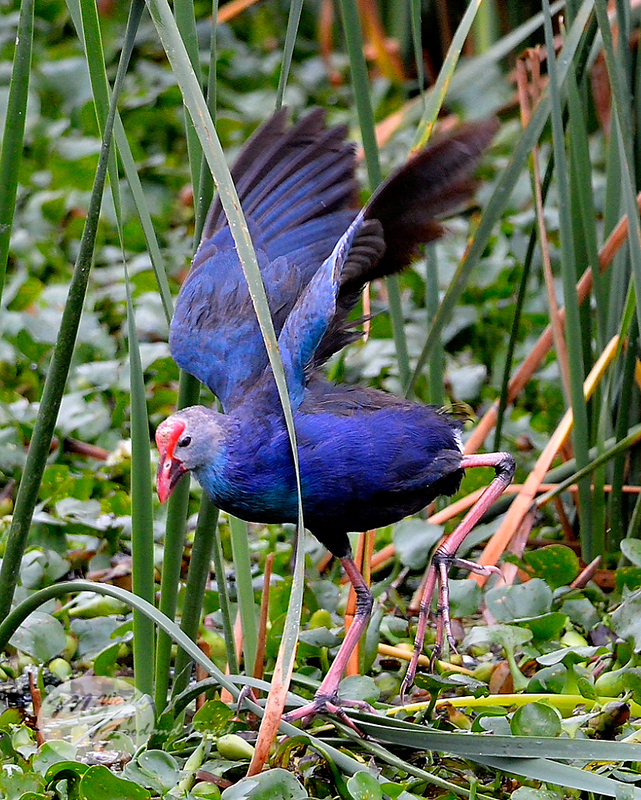 The first birds to gain our attention were the common yet beautiful purple moorhen (aka purple swamp hen). 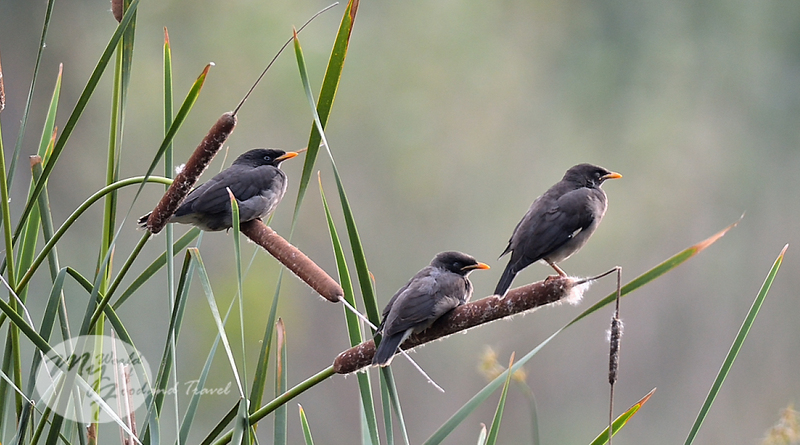 They shone bright among the green lily leaves and reeds, refusing to be camouflaged into the background. Day break had still not arrived and we had to shoot in low light conditions. We scoured the lake for more birds and found a number of coots and common moorhen, scuttling amid the reeds. We strained our eyes a bit and were able to make out the beautiful pheasant tailed jacanas in their breeding plumage. The restless birds were fluttering about, taking short flights. 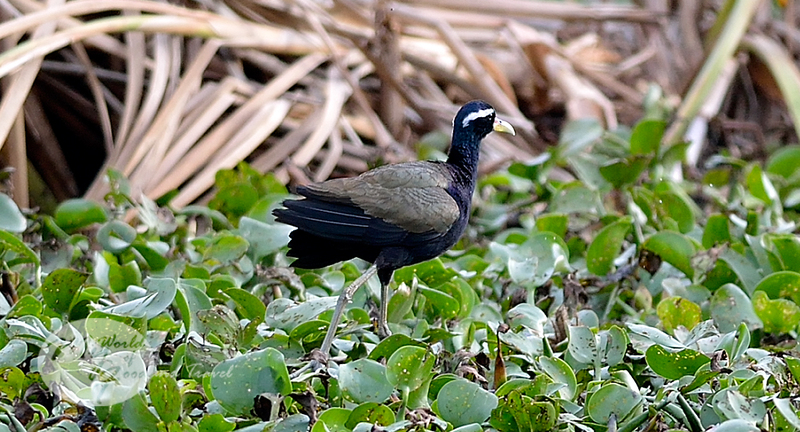 There were also their dark coloured counterparts, the bronze winged jacanas, foraging for food. Strangely, the birds that we are always seeking desperately invariably appeared in unexpected places. 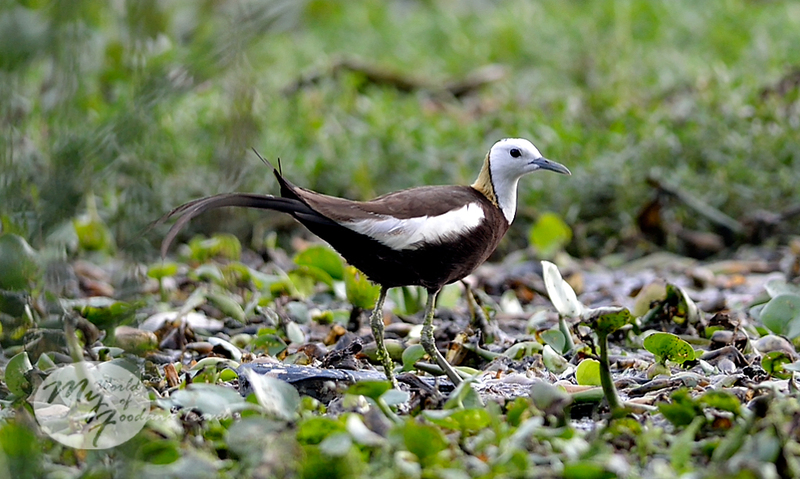 I remember coming across my first bronze winged jacana right after exiting the airport in Guwahati, a bustling city, after looking for it in jungles and lakes. Another time, we painfully stalked a pair of scarlet minivets in Kaziranga for quite some time only to find several of them frolicking in the trees just a few kilometers away from my husband’s house in Tinsukia. Back to our lake-turned-dump yard in Kanakapura. We noticed a few bittern looking birds sitting all hunched up near the water. But they seemed too large to be bitterns. 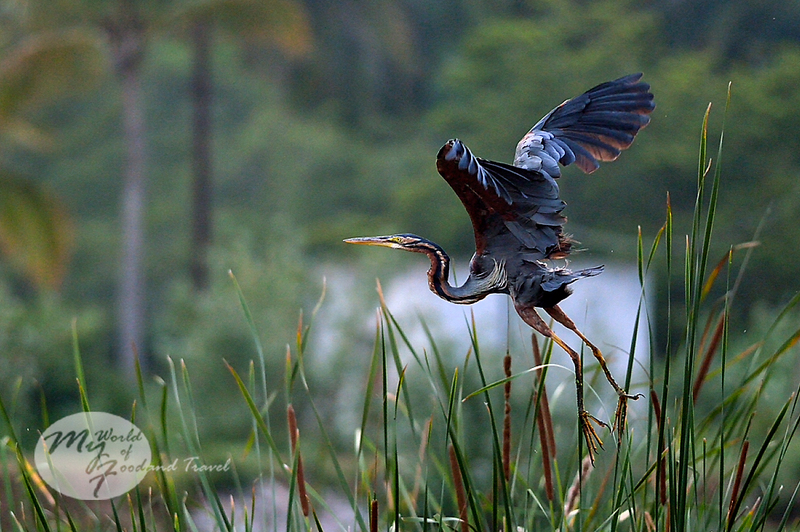 On closer look, they turned out to be juvenile purple herons, their colour more brown than purple. Of course, the parents were also nearby. The husband by now had gotten really excited to see the birds. He left me near the car and crept around to the other side of the lake. He remained there for a long time. I saw a flock of lesser whistling ducks fly up from another part of the lake and again settle down amid the leaves. They were too far to be clicked. 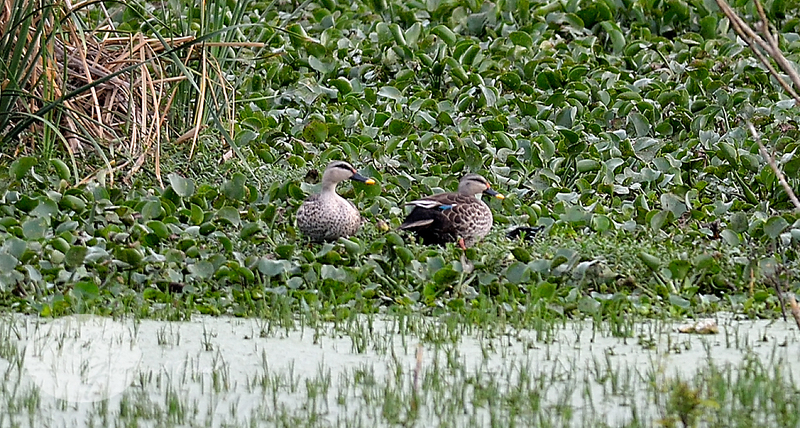 There were also a few Indian spot-billed ducks. 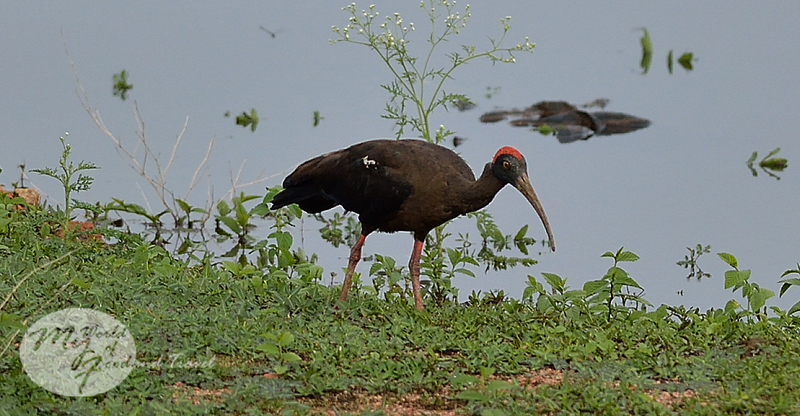 While I observed the antics of the purple moorhen, common moorhen, coots and jacanas, the husband returned with a huge grin on his face. “Guess what I found there,” he looked really pleased with himself. 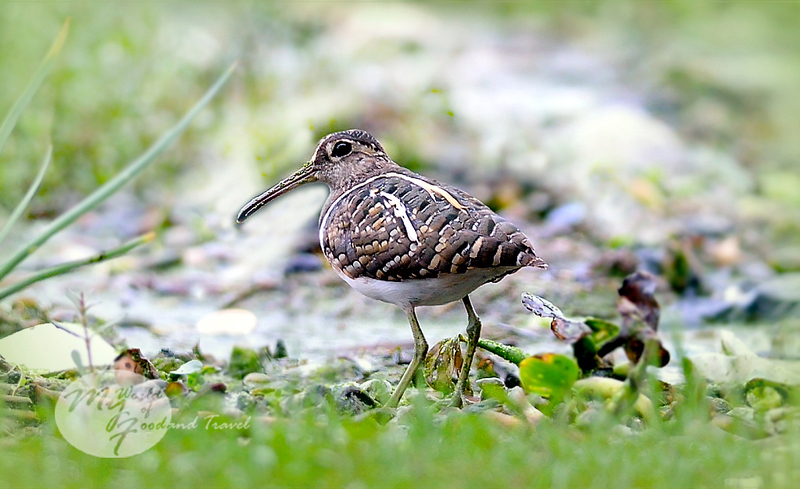 Apparently, he had managed to come across a beautiful greater painted snipe couple. I did feel sad at not being to see them. The husband has now one bird extra in his kitty. We must have spent almost 20 minutes in that lake before going onward with our journey towards Cauvery Wildlife Sanctuary. Another adventure awaited us there. Be sure to catch the second part of this post! PS: In case you want to visit this lake in Kanakapura, look out for a Sri Sai Lodge on your left hand side if you are travelling from Bangalore. The lake is bang opposite the lodge. Just thought I would let you know about this landmark since there are a lot of water bodies around. 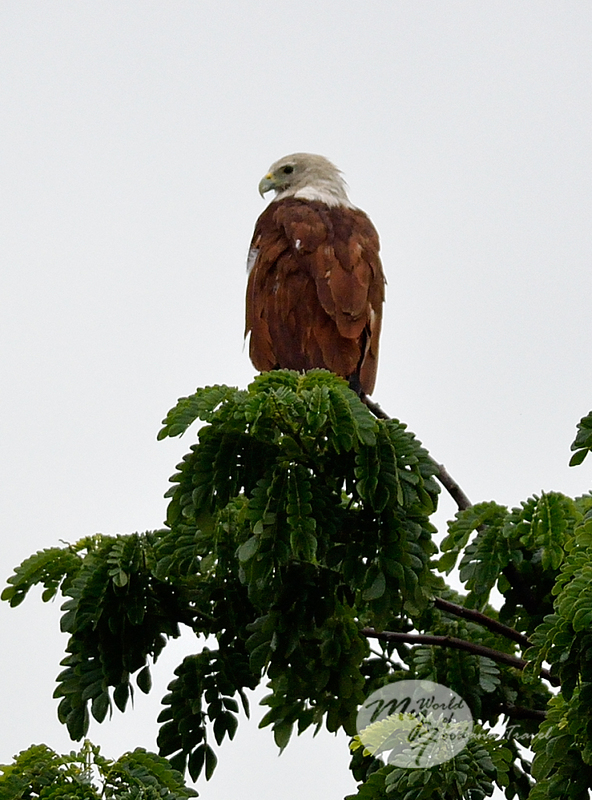 Purple Moorhen, Common Moorhen, Greater Painted Snipe, Red-naped Ibis, Indian Spot-billed Duck, Lesser Whistling Duck, Eurasian Coot, Purple Heron, Grey Heron, Indian Pond Heron, Cattle Egret, Jungle Mynah, Black Kite, Brahminy Kite, Pheasant-tailed Jacana, Bronze-winged Jacana. Pictures Look Awesome..Must visit someday.. The lake is not beautiful, though...full of waste. You should visit Cauvery Wildlife Sanctuary and it's not that far, too. Such wonderful pictures... Waiting for the next part!!!! Thanks! Now I will have to find out time to write the second part. So envious of your bird captures! They make the trip so rewarding. Hi Sangeetha..just a query..can we visit cauvery wild life santuary without going through jungle lodges? ?